How do I grow my career while remaining technical? I don’t want to be a manager, I want to be a senior technical leader. Growing and having more influence means scaling your reach. Let me go into some detail about what I mean by that statement. No matter how good you are, there’s only so much code you can write. Being more senior doesn’t mean you code faster. You don’t finish designs exponentially faster. You are still a single individual, and you will still only get so much done in so much time. Your value as a technical leader is measured by the positive influence you have on the other members of the team. There are many ways that your technical skills can scale across your team. They all have a common theme: As a technical leader, your responsibility is to raise the technical skill level of the development team as a whole. Pair Programming with Junior Staff: You can help junior developers learn good habits, better coding skills, frameworks, language techniques. You can also ensure they are following proper practices (as defined by your organization, be that TDD, formal specifications or other processes). Start an in-house learning program: This could be a lunch and learn series, where developers present ideas to the team. You can take the role of program chair, and drive the content. You can present your ideas, and thoughts on software engineering and development. Mentor Developers: Work with your management to make mentoring junior developers an explicit task. Measure progress by showing how you are helping these junior developers achieve their growth targets. Proactively review designs and code: Reach out to the other developers on your team, and offer to help. Look at what they are doing, and offer feedback. Make sure that the outcomes get noticed: Did you positively influence the design? Are the team members growing as a result of working with you? Propose and Implement training programs: There are a lot of options available for those that want to improve. Everything from online offerings, to libraries of content, to conferences to in person training programs. Work with your team, get proposals, get budget, and make it happen. Measure outcomes: show management that the team is improving. Build something on the side: Work with team members to build proof-of-concept implementations for new libraries and new tools you want to use. You can even consider working with a charity (like HTBox) to buid software that can help their organization. It’s About Your Growth too! If you follow all those suggestions, you may become a very respected senior leader for your tech team. Or, you may be seen as that jerk that criticizes everyone. It’s about how you deliver your ideas. The best senior technical leaders have learned how to critique, teach and help people grow. They are able to make suggestions that help people grow. They are able to have people take pride in their work, and yet want to improve it. If you want to take on this role, you need to spend a lot of time working on how you deliver your ideas to your peers, and to the team members you want to view you as a technical leader. You’re not a manager; you have no real authority. You need to work on your inter-personal skills, and grow the muscle to affect change with everyone on your teams. Yes, I’m talking about soft skills. There are few people that listen. Most are just waiting for their turn to talk. Be a listener. These developers you want to mentor: they have knowledge you don’t. They’ve thought about the problems at hand. They are doing the best work they can today. Your job as a mentor is to tell them they are wrong, but to augment their thinking with your insight. That’s only possible when you listen to the thought process behind their design and code. You have to learn as much as you can about the problem, the proposed solution, and the thinking behind the process. Only after you have listened, and learned as much as you can, will your guidance carry weight. The last piece of the puzzle is to determine if your current organization’s culture values the role of a technical leader. Some do; some do not. You need to work with your managers to see if that role exists in your orgamnization. If not, you can work with your managers to create it. And, if your company and your management team aren’t interested in a role you want, you need to decide if it’s the right fit for you. More and more, it is possible to remain in a technical role and achieve career growth. You need to learn how to make technical skill scale across an organization. You need to convince the team and management of it’s worth. Most importantly, you need to grow the skills needed to be viewed as a technical leader. This is the first of a series of blog posts where I discuss the upcoming feature proposals for C# 7. At the time that I am writing these posts, these are all proposals. They may change form, or may not be delivered with C# 7, or ever. Each post will include links to the proposal issue on GitHub so that you can follow along with the ongoing disussions on the features. This is an interesting time for C#. The next version of the language is being designed in the open, with comments and discussion from the team members and the community as the team determines what features should be added to the language. Ref Returns and Local are described in the Roslyn Repository on GitHub, in Issue #118. What is Ref Return and Ref Locals? This enables scenarios where you want pass references to internal structures without resorting to unsafe code (pointers to pinned memory). Those mechanisms are both unsafe and inefficient. Returning values by reference can improve performance in cases where the alternative is either pinned memory, or copying resources. This features enables developers to continue to use verifiably safe code, while avoiding unnecessary copies. It may not be a feature you use on a daily basis, but for algorithms that require large amounts of memory for different structures, this feature can have a significant positive impact on the performance of your application. One of the interesting design challenges around this feature is to ensure that the reference being returned is reachable after being returned. The compiler will ensure that the object returned by a ref return continues to be reachable after he method has exited. If the object would be unreachable, and subject to garbage collection, that will cause a compiler error. Effectively, this means you would not be able to return a ref to a local variable, or a parameter that was not a ref parameter. There is a lengthy discussion in the comments GitHub that go into quite a bit of detail on how the compiler can reason about the lifetime of any object that would be returned by reference. I was honored to speak at NDC London last week. It’s an awesome event, with a very skilled set of developers attending the event. I gave two talks at NDC London. The first was a preview of the features that are currently under discussion for C# 7. C# 7 marks a sea change in the evolution of the C# Language. It’s the first version where all the design discussions are taking place in the open, on the Roslyn GitHub Repository. If you are interested in the evolution of the C# language, you can participate in those discussions nnow. Instead of posting the slides from that talk, I’ll be blogging about each of the features, with references to the issue on GitHub. I’ll cover the current thinking and some of the open issues relating to each of the features. Watch for those posts coming over the next month. I’ll mix in a forward looking post along with language infomration you can use now. If you have any questions on the samples, the code, or concepts, please make an issue at the repository, and I’ll address it there. This is my second post about the changing year. In this post, I look at the areas where I will invest my time in the coming year. The .NET Core platform is a version of the .NET stack that runs on OSX and Linux in addition to Windows platforms. This is a pre-release project at this time, but there is enough there to beging experimenting. As this platform matures, .NET truly becomes cross-platform. You’ll be able to use C#, F#, VB.NET, and the bulk of the .NET Base Class Libraries to create software that runs on multiple platforms. The Roslyn compiler platform provides one of the key building blocks by running on OSX and Linux. That means the managed portions of the .NET Framework can be compiled on these platforms, and will run effectively. The remaining work is primarily to make the unmanaged portions of the CLR and the libraries run on other platforms. Some of the work here is technical in nature. Other work is to ensure that the licenses used by the .NET framework components are compatible with a cross-platform strategy. Most of the components are released under either the Apache 2.0 license, or the MIT license. Check each library for details. (Notably, the previous restrictions on earlier MS-PL licenses for Windows only support has been removed from anything related to .NET Core). While this work is going on, there is a parallel effort to build out learning materials for .NET Core. This project is also open source, and accepting contributions. (I’ve had a couple PRs merged here already). I’m really looking forward to the date later in 2016 when a production ready .NET environment runs on Windows, Linux, and OSX. This will be a very interesting version of C#. The team is using GitHub issues to openly discuss language features and their ramifications. Go aehead and participate in the discussions. It is really exciting to see the community participate with such passion for different features that they would like to see in their favorite language. As I discussed in the last post, the compiler is Open Source. If you want to experiment with some of the new features, you can try. There are experimental branches for some of proposed features. (The maturity of the implementation varies.) It’s also important to understand that the features haven’t been formally committed to. Do not use those branches in production applications (yet). We’ve entered a world where our web-based applications are managing more data, and scaling to ever larger numbers of users. OK, this trend has been in place for a while, but it’s only accelerating and growing. We have new ways to deliver and scale web-based software. We have cloud platforms that enables us to change the number of instances running. We have docker containers. And, on a related trend, we can offload more and more processing to the client device. That may mean platform specific mobile applications, or SPA style browser based applications. We will be doing more and more work with software that needs to scale by running multiple copies of your application in different configurations. There are many different options for this, and wise developers will learn a bit about each of them. Machines are good at examining very large datasets. Machines are also good at running lots of different scenarios. Put the two together, and I see a trend for more machine learning in the future. The applications we use generate tremendous amounts of data every day. As machines observe and analyze that data, more insights can be gained then ever before. Machine Learning and related algorithms can enable us to play ‘what if’ with more and more different scenarios and make better decisions based on larger and larger data sets. Our data is a bigger and bigger part of our lives. The software necessary for us to interact with that data is smaller (in relation). This trend affects the ‘stickiness’ of any given platform. This trend has a huge impact on how network effects work for modern systems. As an example, consider music applications. Every platfrom has an app that can play music. But, what’s important to users is that they can play the music they’ve already purchased. If you already have an iTunes subscription, you want to play your iTunes music. If you have a Microsoft Groove subscription, you want to play your Groove music. The important feature is access to the data (music) that you’ve already purchased (or subscribed to, or created). That impacts the ‘stickiness’ of a platform. Finding and installing programms for a new device takes a fraction of the time (and possibly money) of updating every subscription to a new platfrom. I believe this portends an interesting trend in the network effects for different applications. Namely, changing device platforms will be a trivial exercise, compared to changing the provider of cloud based data. I believe this means that future platform stickiness will be based on your cloud based data, not your device. Do you want to switch between mobile platforms? That will be easy, as long as your data can come along. If that means recreating or resubscribing to a service, its going to be a non starter. That leads me to the concluson that the clould is more critical than the device. In the coming year, we’ll be focusing on reaching the 1.0 milestone (not beta) for the apps currently in development. We’ll also be ading new applications as the year progresses. I’m excited for the progres, and I’d be happy to see more participation. If you are interested, head over to our home page on github and check out our projects. I’m very happy with all that has happened with Humanitarian Toolbox in the past year. We’ve continued to work on two different applications: Crisis Checkin and AllReady. The .NET Developer Community has really come together to help us achieve important milestones. Crisis Checkin is being enhanced to support Operation Dragon Fire which will provide better data sharing during crisis. Watch the Github repo for updates on new feature requests to support this effort. While Crisis Checkin has been moving along at a reasonable pace, AllReady has been moving incredibly fast. I need to thank our friends and colleagues on the Microsoft Visual Studio team for the incredible contributions they’ve been making to your effort. The Visual Studio team started development as a showcase for many of the new features that shipped with Visual Studio 2015. They recorded a series of videos that documented that initial effort. HTBox took over the code and open sourced it shortly thereafter. We continued to work with community members over the summer, at ThatConference, and remotely to add features. Fall came, and we worked with Microsoft after the MVP Summit to get the application ready for Beta. You can see some of the experience at that sprint here. We successfully hit our beta milestones, and our next step has been a pilot with the Red Cross in Chicago. The pilot has been successful, and we’ve been generating new tasks and feature requests from the pilot. The success we’ve had building software has also brought an increase in contributions. We’re by no means a large charity, but we’r past the bootstrap phase and well on our way to a successful startup venture. The .NET Developer Community members that have contributed to our projects. The Microsoft Visual Studio Team that adopted and help launch development of AllReady. The donors that have made us a financially viable organization. But most of all, my fellow board members at HTBox. I’ve never worked with a stronger and more dedicated leadership team. I’m confident that we’ll continue this momentum over the next year. Earlier this year, we saw the release of Visual Studio 2015, and with it the 6.0 version of the C# language. This is the first release using the Roslyn Codebase. I’m super excited about the rejuvenation of the C# and .NET community as the team reached this important milestone. We have the Roslyn APIs to create analyzers, code fixes, and refactorings. We have numerous new language features to support modern development. We have an IDE and compiler that share more code, and thereby use less memory and have better performance. The code for the C# and VB.NET compilers are Open Source (Apache 2.0 license) and stored on Github. Want to learn more about how it works? Look in the source. Want to participate? Grab an up-for-grabs issue, submit your fix. Want to experiment? Grab the source and try it out. It’s also very instructive to see just how many tests and gates there are for the source code in the compilers. But it doesn’t stop there. In addition to the Rosly source, many other parts of the .NET framework are currently, or are planned to be, Open Source as well. The full list is quite long, view it here. The model of Open Source development is becoming the norm. Apple even responded by making Swift Open Source, also with a permissive license. I believe the Open Source model is one of the key reasons for the rejuvenation of the .NET ecosystem. The .NET Foundation is an indepent organization to support Open Source development in the .NET ecosystem. While it was announced in 2014, its growth really started in 2015. (I’m biased, as I’m on the .NET Foundation Advisory Board). The foundation nw includes parts of the .NET Framework, with source originally from the Microsoft product teams. It now also includes projects that started in the community, and have been brought under the .NET Foundation umbrella. And, this post was written with the newest .NET Foundation project: Open Live Writer. In my next post, I’ll talk about the topics that I think will be key in 2016. One of the major challenges we faced with the AllReady app was building a custom kudu deployment script. There is incredible power in this system, but it takes a bit of research, and a bit of help to get all the pieces working. Let’s start with the simple goal: to make testing easier, we wanted to deploy to a live site automatically whenever we merged a pull request into master. Azure supports this by default, including for asp.net 5 sites. Using Kudu was an obvious choice. Life got complicated when we added a web job to the project. We added a web job because one of the actions the Allreedy application performs is to send messages to all registered volunteers. We don’t want to tie up a thread running in the asp.net worker process for the duration of sending messages through a third party service. That could take quite some time. Instead, we want to queue up the emails on a separate webjob so that the site remains responsive. That’s where deployment got complicated. You see, when we started, webjobs aren’t supported under asp.net 5 yet. The webjob builds using asp.net 4.6, using Visual Studio 2015. We also have one interface assembly that contains the types that are shared between the web application (asp.net 5) and the web job (asp.net 4.6). 1. Build the assemblies that are part of the web application using DNX. 3. Deploy the web site. 4. Deploy the web job. 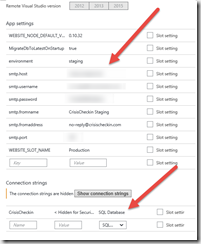 Those extra steps require creating a custom deployment script. Here are the steps we needed for adding our own custom Kudu script. There were several resources that helped create this. First, this page explains the process in general. It is a shortened version of this blog series (link is to part 1). The first task was to create a custom build script that performed exactly the same process that the standard build script process performs. I downloaded the azure tools for deployment, and generated a deployment.cmd that mirrored the standard process. Notice that I’m directing azure cli to generate a script based on my xproj file. But, notice that this does not build the .csproj for the web jobs. Before modifying the script, I wanted to verify that the generated script worked. It’s a good thing I did, because the default generated script did not work right away. The script generator assumes that the root of your github repository is the directory where your .sln file lives. That’s not true for allready. We have a docs directory, and a code directory under the root of the repo. Getting this right got me stuck for a long time. In fact, I needed to get some product team support during our coding event from David Fowler. The version of nuget running in Azure needs to use the V2 feed when it’s restoring packages for a .csproj based project. *Huge* thanks to David for helping us find that. call xcopy /S "%DEPLOYMENT_SOURCE%\NotificationsProcessor\bin\debug" "%DEPLOYMENT_TEMP%\wwwroot\app_data\jobs\continuous\notificationsprocessor\"
The deployment script and the .deployment config are in our repository, so if you want to explore, check it out. Our repository is here: http://www.github.com/htbox/allready. And, if you want to help, check out the issues and send us a pull request. I’ve started working with a new client and it’s re-affirmed my belief in the importance of asking the question “Why”? Follow up with more Why? Make sure you get to the root why. I’m not focusing on the “5 Whys” popularized by Toyota and now part of the 6 Sigma process, although that is important. Rather, it is to focus on understanding why a process was put in place, and why these processes have been established. More than anything else, it’s about listening. In the current scenario, I’m helping a team that is near midway through a product release cycle. They’ve adopted a series of agile processes, build and deployment processes, and common practices for branching in git, deploying changes, and so on. Like all teams, half way through a project, they aren’t sure if every process is working out well. This introduces friction and concern: Should the processes be changed? If so, to what? This is where ‘why’ becomes important. The first ‘why’ to ask is “Why did you adopt this process | tool | guideline?” From this question, I learn what gains a team hoped to achieve. What problems had existed, and how this was intended to help. Once that’s known, it’s easier to discuss the benefits and any unseen costs that a new initiative has brought. On the whole, was it good? The second “why” in this situation is “Why is this new initiative not generating the benefits you expected?” Is there more friction? Are you finding that adopting new techniques took more time and investment than you thought? Are you losing productivity because a technique is not familiar yet? Does the team fear that “we’re not doing it right?” This starts to get to the cause of this new discussion. The third ‘why’ for the team is “Why change now?” One important goal for high-functioning teams is “continuous improvement”. And while it’s important to always look for opportunities to improve, it’s also important to pick the right time for change. That’s especially true if the proposed ‘change’ is at large scale. (Example: I’m not switching Source Code systems a month before release. Too much churn, not enough gain). Related to that, if a team did implement a major change before starting this release cycle, has it been fully explored? OK, give me a little license here. I know I can’t ask questions of a software tool. But, the point is that sometimes teams adopt a tool, or toolset, and then fight that tool because they don’t want to understand why it works the way it does. One example from a previous client is git. They had planned an initiative to move from SVN to git. However, they did not expect this to change their workflow, or their overall development workflow. They didn’t develop a branching strategy. They didn’t work through the distinction between commits and push/pull. Git failed badly for them. They were fighting against the toolset. This example is not meant to take a position on centralized vs. distributed source control, or on a particular vendor. Both workflows can be done well. Both workflows can fail. The point is to work with your tools, not against them. Sometimes that means picking different tools. Sometimes that means adopting a different process because of the tools you want to use. In addition to asking “why” a tools was designed they way it was, it’s important to ask “why” the team picked a certain toolset. Did they originally intend to adopt the mindset supported by the tool? Or were there other drivers? Some people really listen. Others simply wait for their turn to talk. Be the former. That sums up what’s necessary to really bring about change and to really have a positive impact. If you listen to all the team members explain their issues, describe what is and what is not working, you will be in a much better position to make a positive impact. You’ll also be solving real problems. Problems that real team members have described. You’ll have a bigger impact. I forgot to fork before I started working, and how to fix it. Last weekend, Humanitarian Toolbox held a very successful coding event at That Conference. We got quite a bit done on both the crisis checkin and the All Ready applications. Thanks to the organizers of ThatConference, and everyone that attended during the weekend. I’m always impressed by how many developers join us there, and by how much they contribute. OK, enough of the public service announcement. I wrote this post to help with a common issue: Pull Requests vs. Commit Privileges. All the Humanitarian Toolbox projects use the Fork & Pull model for development. It enables us to keep the core contributor teams small, and yet enables anyone that wants to contribute to make changes and submit them. I, sadly, didn’t announce that clearly enough to all the volunteers when we started our event. Many of the volunteers thought we were using the Shared Repository Model. That meant that later in the event, I had a number of developers come to me with issues because they could not commit to the main repository. That’s because they didn’t have the rights. Announcement: Don’t fix this by just giving commit privileges. It’s not necessary. Announcement II: Don’t fix this by trying to copy your changes and merging by hand. It’s not necessary either. Thankfully, this is really easy to fix, once you understand how git works. It does also require using the git command line. The git command line isn’t that hard, and it’s important to learn as you do more with git. If you ever run into this issue, follow the instructions below to fix it. What Happened to Cause this Problem? Before I explain the steps to fix the problem, let me describe what happened, and why it’s a problem. Look at the image below. It’s a portion of the main window in my Github for Windows application. You can see that I have two copies of Crisis Checkin on my local machine. The top one is the clone of a fork that I made in my account. The bottom one is the clone of the master HTBox repository. These two copies have different remote repositories. When you execute a ‘git push’, you’ll send your changes to the git repository identified by origin (by default). If you cloned the main repository, git will try to push to that main repository. 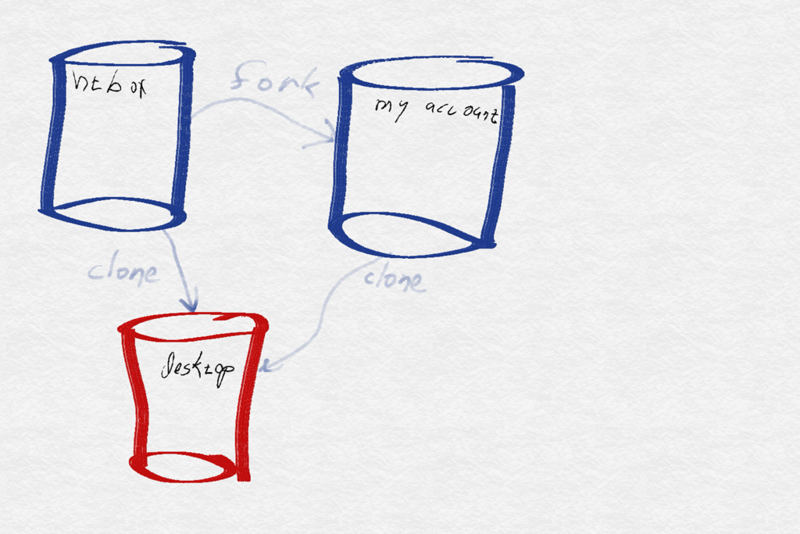 If you forked, and then cloned your fork, git will try to push to that forked repository. The goal is to push the changes you made in your desktop to a fork of the repository where you have commit rights. The drawing below shows the relationship between the repositories, and the commands used to create each one. I usually create a fork from the github.com website. (Just press the “fork” button in the upper right corner). That creates a copy of the main repository in your account. This copy is also located on the github servers, not on your drive. This fork is where you want to push your changes. Now, you need to configure your fork as a remote repository for your working directory. Looking at the image above, you want to push from your desktop (where you have made changes) to the fork (the upper right repository). Replace ‘fork’ and the URL with a name you want to use and the URL of your fork. I use ‘fork’ as the name, because it’s easy for me to remember. You can add new remotes as long as the additional remotes are related to the origin remote. (Unless you start forcing git to do things. 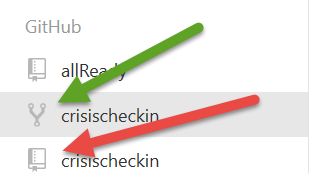 That means you can’t accidentally push your changes to crisis checkin to a fork of the Roslyn project (for example). Now, your local copy is configured with two remotes: The source for the application (owned by HTBox) and your fork (owned by you). These two remotes are named ‘origin’ and ‘fork’. By adding the extra parameter to the push command, you specify the remote repository where you changes should go. Unless it isn’t. If it has been a while since you cloned the original repository, you may need to sync your working directory with upstream changes. That’s documented here. It’s variation of what I just described, but you should be able to follow it. After you’ve pushed your changes to your fork, you can open a pull request to discuss your changes and get them merged into the main repository. After I’ve finished this work, I will often make a new clone of my fork for a given repository. That way, the default remote (referred to by ‘origin’) points to my fork, rather than the main project.